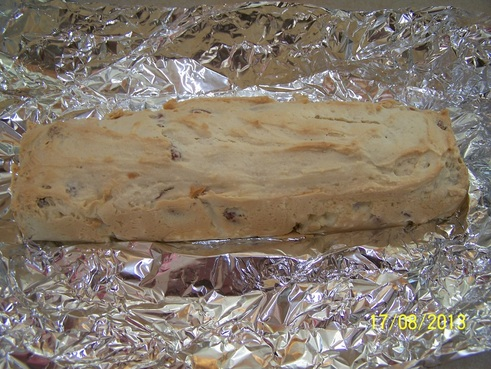 For years now I have been making my aunts Almond Bread recipe and we have loved it. 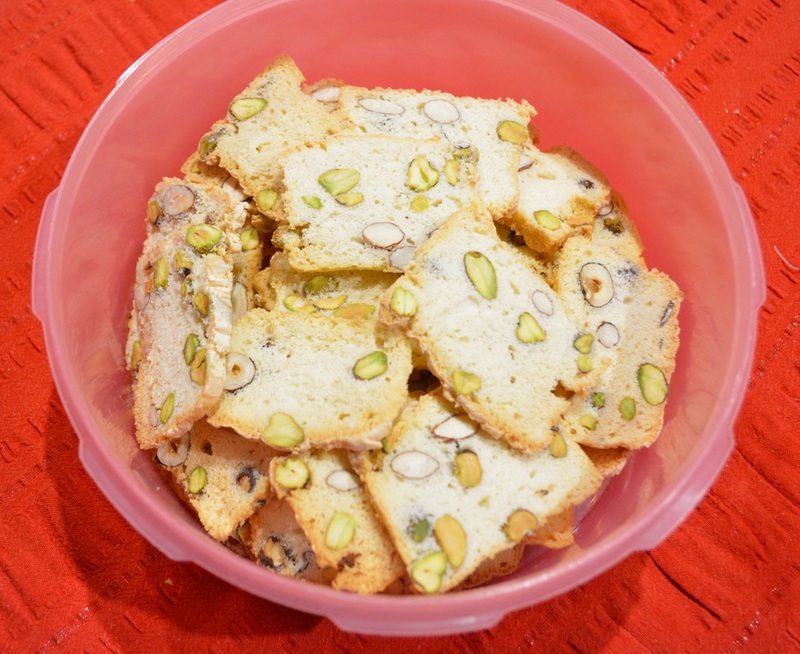 The other day I came across this Mixed Nut Biscotti recipe in one of my magazine clipping folders and I thought I'd try it. I loved the flavour I got by putting in a variety of nuts, absolutely delicious. Quite different from just using almonds. They were crisp, exactly how I thought they should be. You cannot buy them like this, they just taste so much better when you make them yourself. And they are so easy to make. My sons school was having an athletics carnival, so I thought I'd try them out there. Parents were asked to bring in some food for the teachers. So I took these in and they were a hit. One teacher actually asked to meet me as she loved them so much, it was quite flattering. You can use frozen egg whites (that have been defrosted first), they work perfectly, so don't throw egg whites out anymore. If you are using fresh eggs, the recipe uses only egg whites my tip for using up the egg yolks is to make up a custard. My Portuguese custard tarts are a great way to use up the yolks. If you don't feel like making the Portuguese custard tarts, simply make the custard as per recipe as it is delicious and fill shop bought pastry cases with the cooled custard, top with fruit, easy simple dessert. This recipe is so simple to make. You can easily double the recipe, you will just need two baking tins. I double it all the time as they last a long time in an airtight container. Having said that, they don't last very long in my house. Also, you can use any combination of nuts, or single variety, to the weight of 125g. Unfortunately I don't know what magazine this came from, so I can't give them credit they deserve. Preheat oven to moderate 180C. Grease and line base and sides of a 26 x 8 x 4.5cm bar tin with baking paper. Spread the almonds, hazelnuts and pistachios onto a flat baking tray and place in the oven for 3 minutes, until nuts are just toasted; cool. Place the egg whites in a large, clean, dry mixing bowl. Using electric beaters, beat egg whites until stiff peaks form. Add the sugar gradually, a tablespoon at a time, beating constantly until the mixture is thick and glossy and all the sugar has dissolved. Add flour and nuts. Using a metal spoon, gently fold the ingredients together until combined. Spread the mixture into your prepared tin, smooth the surface. Bake for 25 minutes, remove from the oven and cool completely in the tin. Preheat oven to moderately slow 160C. Using a sharp, serrated knife, cut the baked loaf into 5mm slices. Spread slices onto baking paper lined oven trays and bake for 15 minutes, turning once halfway through cooking, until slices are lightly golden and crisp.